Playing with other instruments or voice demands that the piano is to correct pitch and in tune. The international standard is A-440, to which all instruments tune. Pianos are built to be maintained at this pitch. Allowing the instrument to lose pitch, and therefore tension, will result in multiple tunings to correct it, and possibly, damage to the instrument. Your ear is trained to hear at this pitch, and to hear the instrument in tune. If, however, the piano is out of tune, or worse, the pitch is incorrect, your ear will be trained to hear incorrectly. As tuning and pitch change slowly and very subtly, your ear does not necessarily recognize the incorrectness, but rather learns to hear it as correct. Very often when a piano is not in regular use anymore its service is neglected. This leads to a continuous drop in pitch, an unplayable instrument, and possible damage to the instrument. It is important to maintain the instrument at least at minimal intervals, yearly, to prevent this. A piano whose pitch has dropped only two cycles per second to A-438 will need a pitch raise. This is a separate tuning performed just to correct the pitch. In fact, it is not really a tuning as the strings are brought up, or down, according to just how far off each one is. The emphasis is to ultimately make the string "stay" where it is put. Therefore the piano probably will not be more than "playable" as a result and will go out of tune further quite rapidly as the strings stretch under the new tension, requiring at least a fine tuning to make it correct. 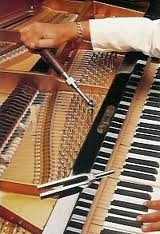 Changing the tension on a string to correct the pitch changes the pressure across the entire piano’s structure causing previously tuned strings to change. Also, changing the tension on individual strings stretches them, most often unevenly across their length. A string will correct this with time and "even" itself. Another concern being the fact that a string only sounds good when it is stretched to near its breaking point, remember stretching a rubber band as a child? This prevents changing the tension too much too quickly. Changing the pitch just a few cycles per second could change the tension on the piano over two tons. This creates an unstable condition, which is why after a short period of time the second, or fine tuning is performed. If the pitch has changed greatly, more tunings may be required to correct it. The purpose being to eventually leave the instrument in a stable condition at A-440 and, hopefully, not break strings in the process. To accomplish a fine accurate tuning, the pitch must already be very close to correct. If your piano has not been tuned for a year or more, it could be a quarter of a tone or more out of tune and require two or more tunings to correct. Additionally, if your piano has problems such as tuning pins which are loose or rusted, strings which are rusted or corroded, bridging which is split or damaged, and/or a damaged pinblock, it might not be possible to correct the pitch and tune the piano without first performing other, more major work, or rebuilding.